This time, she will be joined by 114 women and 7 men from 20 counties who are representing and raising funds for 261 Fearless, Inc., Switzer’s new global non-profit that empowers women around the world through a social running community. Despite this inauspicious beginning, the Boston Athletic Association (BAA) early on realized the seriousness of women’s desire to participate and the potential of their endurance. In 1972, five years after the ‘Switzer Incident’, the BAA welcomed women as official competitors. Switzer was 3rd in that race, ran Boston eight times, and posted her personal best of 2:51:37 in the 1975 edition. 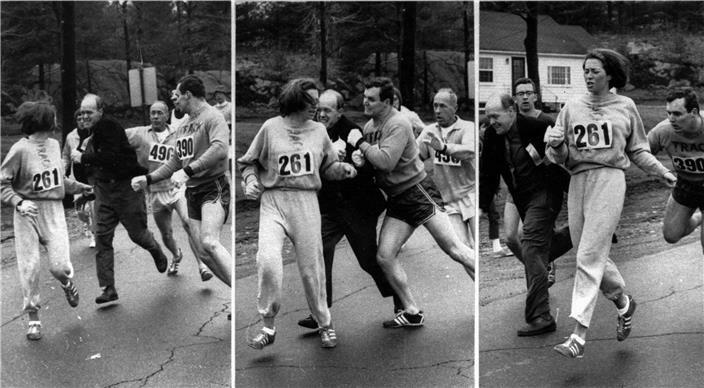 Boston was the first major marathon to admit women; this opened the floodgates for women’s participation globally. "We are so pleased to welcome back Kathrine to the race which elevated and hastened the movement in women's sports," said B.A.A. President Joann Flaminio. "She has always been a fearless woman, and we look forward to concluding our year-long '50 Years of Women at Boston' celebration when we greet her at the finish line next April 17."